This week marks the funeral of Margaret Thatcher. Leaders from all over the world will be in attendance, including our own. Though the two never knew each other, never met, and were from different generations, President Obama and Prime Minister Thatcher share some common traits that make them more alike than most people know. Like our own chief executive, Thatcher was a pioneering figure, serving as Britain’s first female Prime Minister. For the tradition-bound British, a break from male leadership was as equally historic as our election of an African-American president. While Thatcher’s selection as PM was sufficient to earn her a place in the history books, she would have been a footnote had her government been a terrible failure. It was her success as economic emancipator of England which secured her place as the most important female political figure in English history, second only to the first Queen Elizabeth. Also like our President, Thatcher was a combative ideologue. Thatcher came to power during a time when liberalism ruled the Empire. The British economy was in the tank, unemployment was high, and the demands of unionized labor prevented any serious economic reforms. Thatcher’s solution was an assault on the forces of liberalism not unlike Elizabeth’s attack on the Spanish Armada. The combination of privatizing inefficient government agencies, lowering tax rates, and deregulation was controversial and politically dangerous. Once enacted, however, Thatcher’s policies created huge opportunities for entrepreneurs who quickly turned England into the financial center of Europe. Thatcher’s decade in office saw rates of unemployment and inflation decline while GDP and British influence grew. Thatcher showed that limited government and free markets work. President Obama is also a combative ideologue, but his agenda is a rejection of everything that Thatcher believed. Higher taxes on the successful, increased government regulation, and redistribution of wealth are policies that Thatcher buried decades ago. The President proposes to resurrect them all. His latest homage to big government is found in his 2014 budget proposal. Among a slew of tax hikes and regulations, the President also proposes to limit how much people can save for retirement on a tax-sheltered basis. According to the budget plan, the total amount a person would be able to save in a tax-sheltered retirement account would be limited to a sum that yields no more than $200,000 a year in payments. Yes, of course you can save more on your own, but you’ll lose the tax benefits if you save more. Why? Because President Obama thinks it’s unfair that some people can save more than others. This is exactly the sort of value-laden, micro-managing liberalism that Thatcher opposed. In her view, economic decisions made in the name of “fairness and equality” could have negative consequences on individual liberty, like how comfortable your retirement should be. Economic liberty and individual liberty are inherently linked, and Thatcher vowed to defend both. As her favorite economist Frederick Hayek argued, liberty is not just threatened by swift, overt, and militant action. Liberty can also be eroded by slow, incremental, and seemingly benevolent economic regulations as well. Thatcher knew intuitively what liberals still don’t understand: free-markets work because they maximize liberty, and liberty is the key ingredient for human success. What makes liberals like President Obama resentful towards Thatcher is that the benefits of her free-market policies, as demonstrated in the empirical data from her time in office, are unequivocal and staggering. Liberals love statistics, but not when they work against their core beliefs. Thatcher proved them all wrong, buried socialism in the ash heap of history, and they can’t forgive her for it. Prime Minister Thatcher and President Obama are also alike in another way – both set out to be transformational leaders. By embracing free-markets and limited government, Thatcher rescued England from a failed ideology and kept the sun from setting on the British Empire. President Obama seeks to transform America as well by providing hospice care for an ideology that is gasping a slow death elsewhere. Liberalism has shown its true colors in struggling European countries like Greece and Spain. President Obama still holds to the dream that he can remake the country along the European model. Nice read, I think Thatcher has undoubtedly left an everlasting political and social legacy. I don’t think her policies were implemented as she presented them or at least, they did not have their desired effect. Wow. I must admit that when I read the title of this post I cringed, gritted my teeth, and prepared for the worst. Thankfully I was wrong to be so wary. 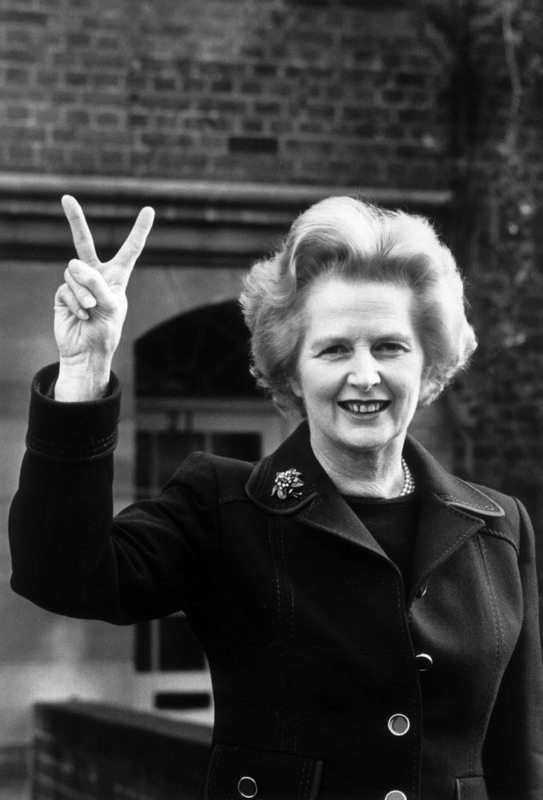 Margaret Thatcher and our current “leader” are miles apart in their core beliefs. Unfortunately for the American people, Mr. Obama will lead us straight into the miry depths of financial ruin, but not until he pries what is left of our savings from our hands. Of course he is against the free-market we are so desperately clinging to because in his clouded vision it is unfair. Ironically the only “unfair” point of interest on the free-market is the fact that while my husband and myself, and thousands like us, are being forced to relinquish the paychecks that we worked for in order to fund the bank account of someone who refuses to do the work himself. THAT, is not fair. Redistribution of wealth? No thanks, I’ll pass. A couple of years ago, a YouTube video was posted about the redistribution of college students’ GPAs. Their response: “NO WAY! I worked hard for my grades!” The exact same is true of the redistribution of wealth. If you want it, YOU must work for it. My husband and I have enough children to provide for. We do not need to provide for the 40 year-old man, who refuses to contribute to society in a productive way. Mr. Obama would do well to read his history books, and watch the news about the state of some of our neighbors across the pond.